CHIANG MAI – Recent weeks have seen some of the heaviest fighting in Myanmar’s decades-long civil warvwith government forces launching determined attacks against the Kachin Independence Army (KIA), an ethnic guerrilla force in the far north of the country. For the first time ever, the government has used helicopter gunships and modern, sophisticated attack aircraft against the ethnic rebels, an escalation that has earned condemnation from human-rights groups and undermined President Thein Sein’s credibility as a national peacemaker. Most of the fighting is taking place around the KIA’s headquarters at the border town of Laiza near China. The government seems determined to crush the Kachin resistance and gain control over the area now administered by the rebels. The ongoing offensive may cripple the KIA militarily, but it will likely not defeat the rebel resistance. Observers fear that the outcome will be intense ethnic hatred, making it even more difficult to establish a lasting peace. Many Kachin now feel that there is no place for them in Myanmar. “We know that it is wrong to feel that way, but we can’t help it,” says a Kachin women in the state capital Myitkyina. Adding insult to injury, the airstrikes against the Kachin, the vast majority of whom are Christian, began in earnest on Christmas Eve. “This we will never forget or forgive,” said a Kachin community worker. The Kachins have become even more antagonized because of pro-democracy icon Aung San Suu Kyi’s refusal to intervene in the crisis. Despite several appeals to the former Nobel Peace Prize laureate to act in a war in her own country, Suu Kyi has steadfastly refused to take a stand. On January 6, she told Agence France-Presse that she would not step in to help end the worsening conflict without official approval. It is widely suspected that the once fiery opposition leader has reached an informal accommodation with the government where she is allowed to act as a mainstream politician via her seat in parliament but has been barred from criticizing the military or becoming involved in the ethnic issue, which is a question of national security and therefore the responsibility of the military. The escalated military campaign has also sent a stark signal to other ethnic armies which have entered into ceasefire agreements with the government. 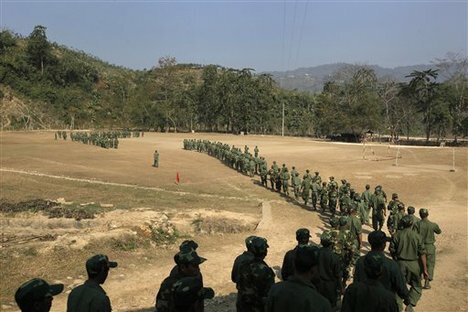 In a statement issued on January 1, the United Nationalities Federal Council (UNFC), an umbrella organization of about a dozen ethnic groups, some with and some without ceasefire agreements with the government, saying that they feel threatened by the offensive against the Kachin and called for unity among Myanmar’s multitude of traditionally factious ethnic militias. If that persuasion proves futile, other ethnic rebel groups could act to suspend all talks with the government as long as the attacks continue in Kachin State, according to a UNFC spokesperson at a press conference in the northern Thai city of Chiang Mai on January 10. According to the official version of events – as outlined by Aung Min, a minister in the President’s office, in an interview with the US National Public Radio on January 7 – fighting broke out when the KIA refused to remove some “barbed wire fences” near Laiza to enable government forces to “move in and deliver food”. For more than a year, Aung Min has been in charge of government-initiated talks with ethnic groups as well as Myanmar dissidents in exile. Several rounds of new talks with the Kachin in 2011 and 2012, some involving foreign interlocutors such as the Switzerland-based Center for Humanitarian Dialog, have produced no tangible results. Instead, Aung Min’s fanciful statements and other government denials about the extent of the offensive have only added fuel to the Kachin’s fire. The government initially denied using air force against the Kachins, but Thein Sein backtracked after widespread international news coverage of the aerial assaults. Independent observers point out that preparations for the offensive began several months ago, when government forces began to move heavy weapons including artillery into the area. In November, villagers in Karen State in eastern Myanmar were startled when airplanes dropped bombs and machine-gunned their rice fields and other plantations. The Karen National Union (KNU), the ethnic army in the area, has a ceasefire agreement with the government, so the attacks, which did not hurt any locals, came as a surprise. The government told the villagers the aircraft were taking part in a “military training exercise,” which in hindsight seems to have been an armed rehearsal for their offensive in Kachin State. Judging from photographs taken in Kachin State, the aircraft appear to be Hongdu JL-8 or Karakorum-8, light attack aircraft that Myanmar acquired from China several years ago. The helicopter gunships used in recent offensives are Russian-made Mi-35, the export version of the Mi-24 Hind that was used extensively in the Afghanistan war in the 1980s. Myanmar bought its first Mi-35s in September 2010, when the KIA still had a ceasefire agreement with the government. The Kachins say they waited in vain for 17 years – from 1994, when they first made peace with the government, until hostilities broke out as government forces entered KIA-held territory in June 2011 – for political discussions about the future status of the frontier areas. Other weapons used in the current Kachin offensive, which Myanmar, a neutral country with no external enemies, has acquired or developed since the first ceasefire agreements were concluded with various ethnic and political rebel forces include 60, 81 and 120mm mortars, 105 howitzers, 75mm recoilless rifles and 84mm Swedish-made Carl Gustaf rocket launchers. On November 9, 2011, a Russian Antonov 124-100 – the world’s second-largest operating cargo plane – landed at Mandalay’s international airport (The long-range aircraft can cover the distance from Russia to Myanmar without stopping or refueling). The plane was off-loaded at night and the cargo was trucked away in a military convoy. It is not known exactly what the plane carried, but well-placed Myanmar sources suspected at the time the secret cargo could have included anti-aircraft missiles or parts for such missiles, or radars for the Myanmar military’s Bureau of Air Defense. Another more likely explanation is that the plane carried Mi35/24 Hind helicopter gunships, then already destined for use against the Kachins and other ethnic rebels in the border areas. Whatever cargo the huge plane carried, it shows that Myanmar’s purchases of sophisticated military equipment from abroad have not ceased despite Thein Sein’s recent charm offensive with the United States and European countries and that much of it is meant for use against ethnic resistance forces. There are two fundamentally opposed and seemingly incompatible views on how Myanmar’s decades-long ethnic quagmire should be resolved. The KIA and other ethnic groups want autonomy within a federal union, while the government wants to uphold the present 2008 Constitution, which lays the foundations for a centralized system. Critics argue that the ceasefire agreements that the government has reached with a dozen or so ethnic armies other than the KIA have merely frozen underlying problems without providing lasting solutions to what is essentially a political problem. Those ceasefires thus remain fragile and could end in the same way as the now collapsed agreement with the Kachins. There are at least 50,000 men and women under arms across the country in various ethnic armies, according to foreign military observers. Earlier there was hope among ethnic groups when Suu Kyi was released from house arrest in the old capital Yangon in November 2010. She then called for a second “Panglong Conference,” a reference to an agreement that her father, Aung San, who led Myanmar’s fight for freedom from colonial Britain, signed with representatives of several of Myanmar’s many ethnic minorities at the small market town of Panglong in Shan State on February 12, 1947. The agreement paved the way for a federal constitution that came into effect when Myanmar declared independence on January 4, 1948. Aung San was assassinated by a political rival in July 1947, but his Panglong Agreement was honored in Myanmar’s first constitution. Some ethnic minorities, notably the Karen, resorted to armed struggle anyway, and parts of the country were plunged into civil war. In March 1962, Myanmar’s experiment with parliamentary democracy and federalism ended abruptly in a military coup. The new government, led by Gen. Ne Win, adopted a strictly centralized power structure and the insurgencies flared anew, especially in the Shan and Kachin states, which until then had been relatively peaceful. When Suu Kyi first broached a “Second Panglong” she received the backing of several ethnic leaders and organizations, but government authorities branded her a “traitor” for resurrecting the idea of autonomy for the minorities. She has since gone quiet on a “Second Panglong” and her silence has cost her the popular support she once enjoyed in ethnic areas. The muted response by the international community has also been a disappointment for many Kachins. In an interview published on January 9 in the Irrawaddy, an independent website and journal, US ambassador to Myanmar Derek Mitchell expressed “concern” over the situation in Kachin State but stopped short of condemning the attacks. Two years ago, before the US’s engagement with Myanmar, observers say Washington would have strongly condemned the escalation. Myanmar has since distanced itself from its previous reliance on China. There are no doubt concerns in Western capitals that any harsh criticism of the Myanmar military’s actions could push the country’s rulers back into the arms of the Chinese. On January 9, The Wall Street Journal quoted a spokesman for the United Nations Office for the Coordination of Humanitarian Affairs in Yangon saying that “there have been signs of only limited displacement of people so far in the state.” Wunpawng Ninghtoi, a community-based organization in Kachin State, however, have documented tens of thousands of internally displaced persons, most of them in KIA-controlled areas. The International Crisis Group (ICG), a Brussels-based think-tank, announced in late November that it would present Myanmar President Thein Sein with its top honor at an annual “In Pursuit of Peace Award Dinner” in New York in April this year. ICG did not respond to questions submitted by Asia Times Online whether the group will go ahead with the award, or withdraw it because of the government’s airstrikes and bombardment of Kachin rebel positions and civilian settlements near the Chinese border. In an open letter to ICG, Kachin community groups and Southeast Asian human-rights advocates have condemned the group’s decision to honor the Myanmar president. The 2008 constitution devised by the country’s previous military leaders remains the main obstacle to resolving the ethnic issue. Significant clauses, including those concerning state structure and ultimate military control over the decision-making process, cannot be considered without the approval or more than 75% of all parliamentarians in both the Upper and Lower Houses. Any amendments would then need to be approved through a national referendum. In practice, this makes any fundamental constitutional reform impossible without the explicit consent of the military as 25% of parliament consists of military officers appointed directly by the commander-in-chief of the Defense Services. Scrapping the 2008 constitution and drafting a new charter based on a federal concept is the only viable way ahead to resolving Myanmar’s seemingly endless ethnic problems, ethnic group representatives argue. But judging from the government’s response to such demands and the relentless offensive in Kachin State, that is not likely to happen any time soon. And with Suu Kyi now seemingly on the side of the military, the gap between majority Burmans and ethnic minorities has never been wider.